General FAQ - Contour Design Inc.
Below is a list of our frequently asked questions. For product specific questions, please refer to our troubleshooting solutions page here. 1. Why should I use a RollerMouse? Every RollerMouse line of product is designed to relieve pain and maximize comfort while working. Its patented design eliminates harmful movements and allows users to continually use safer working habits and better posture. If you are looking to alleviate pain and strain, or just want to ensure that you can work comfortably all day, a RollerMouse is right for you! 2. Which RollerMouse is right for me? Each RollerMouse shares the same ergonomic design principals that make it the premier solution to combat the negative effects of using a computer mouse. That said each RollerMouse is designed for a different type of user. RollerMouse Free3- Great for desktops and compact keyboards. Free3 also comes with the most customizable buttons for those who prefer to use shortcuts instead of drop-down menus. RollerMouse Red/Red+ – Our most advanced and versatile mouse. The Red is a great companion for keyboard trays and desktops alike. The Red+ gives users an extra 2.25 inches of palm support to fully support those with large and extra-large hands. On top of that, it is our most precise RollerMouse ever, allowing users unparalleled control of the cursor. Still unsure of which RollerMouse is right for you? Check out our *RollerMouse Comparison Chart* here. 3. What is the difference between the Contour Mouse and the Unimouse? Each of our one-handed solutions are suitable for any desk setup, including: keyboard trays, laptops, stand-up desks, mobile workstations, and multi-monitor setups. Please see our convenient comparison chart. * Buttons for each model are programmable using our Contour Mouse driver. Our drivers are available here. ** Contour Mouse wired requires the driver in order to adjust the cursor speed. 4. Will RollerMouse work with my computer? Yes. RollerMouse products are designed to operate on a plug-and-play basis on a PC or Mac. The RollerMouse Free 3, Pro 3, and Red all have a PC mode and Mac mode for shortcut button compatibility. Please see our online product manuals here for help on switching between PC and Mac mode. RollerMouse will work on Linux devices, but we do not provide technical support for this software. If you’re using a Mac with RollerMouse Pro2 or Free2, the ‘one touch’ copy and paste button functions will not work without a driver unless you are using ‘Microsoft Office for Mac’. 5. What keyboards are compatible with a RollerMouse? All of our RollerMouse products will work with any flat edge keyboard, however, we do not recommend using a RollerMouse with a curved keyboard, or a keyboard with a built-in wrist rest. Our Balance Keyboard is designed to be fully compatible with the RollerMouse Red, Red Plus and Free product lines. 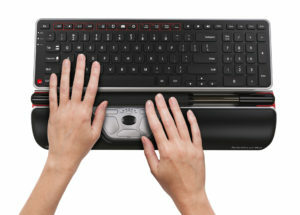 The RollerMouse Pro product line is best suited for workstations that include full-sized keyboards. 6. Can I use a traditional mouse together with a RollerMouse? Yes, RollerMouse can work in conjunction with other mice, both external and integrated (e.g., touch pads). Tip: If you decide to keep your traditional mouse when learning to use a RollerMouse, make sure to place your traditional mouse out of reach, so you don’t reach for it out of habit. 7. Do I need to use a driver? All RollerMouse products are pre-programmed with smart button functions. This built-in software gives users the most ergonomically beneficial set of button functions so you can just plug-and-play. However, you may wish to use the driver to manually change button functions for even greater functionality and variation. Due to the difference in copy and paste commands on a Mac, the corresponding buttons on Pro2 and Free2 won’t work without the driver. RollerMouse Free3, Pro3, and Red models all have a PC mode and Mac mode built in. Please see our online product manuals here for help on switching between PC and Mac mode. 8. Will the RollerMouse work with a KVM switch? As of this time none of our RollerMouse products are meant to be compatible with KVM switches. Due to the nature of some KVM switches, you may find that your RollerMouse is in fact compatible; however, the RollerMouse is not designed to be used with a KVM switch. Most KVM switches must determine if the input device is a keyboard or mouse, which creates a problem when connecting a RollerMouse. Despite this, there may be some KVM switches that are able to recognize devices other than a standard mouse or keyboard. Please contact us at support@contourdesign.com for more details. 9. Where can I buy a RollerMouse? Our products are available for purchase on our website. 10. I don't know what size Contour Mouse I need. Your size is determined by measuring from the tip of the middle finger to the first crease of the wrist. 11. How does the 30-day trial work and how can I sign up? There are full instructions as well as sign up form available here. Contour Design has a 30-day money back guarantee. You are welcome to return any of our products that you desire within 30 days of your purchase, no questions asked. We will pay for the unit to be shipped back to us if it malfunctions within the first 30 days. Please help us help you by retaining your receipt and the original packaging and all of its contents, including all parts and manuals. Without original packaging, a $20 restocking fee will be charged for both purchased and trial units. Please understand that we will pay the shipping for sending out a replacement model in the case of a damaged unit, but would ask you to pay for shipping for returning a perfectly functioning product. We will refund the full product cost. 13. What is the warranty? We warranty our products from factory or manufacturing defects for the period of time listed below. If you are experiencing an issue with your device please consult our troubleshooting solutions page here. If you are unable to resolve the issue please fill out our support ticket form here and one of our support technicians will contact you directly. The support technician will troubleshoot your device and will determine whether the issue can be resolved via email/telephone, or if you will need to send your device to us for repairs. In the event that your device cannot be repaired, a replacement unit will be issued as long as the unit is under warranty. If you dropped our product or spilled liquid on it, or damaged it in some other way, we cannot cover the damage under our warranty. 14. Is my wireless product from Contour secured by encryption? Yes, all wireless products from Contour Design are secured by encryption. The communication between the dongle and the wireless product (2.4GHz) is secured by an algorithm called AES 128 bit, which is an industry standard when it comes to encryption on consumer devices. During the pairing process a random encryption key is generated and exchanged between the dongle and the wireless device, and that is stored and used afterwards to secure the communication. The pairing process is kept secure by the fact that it happens only upon user request, and it is intentionally very short range which prevents eavesdropping. 15. When will my order ship? Please allow up to 2 business days to process your order. You will receive tracking information once the order leaves the warehouse. 16. What is my tracking number? You will receive tracking information via email once your order leaves the warehouse. Please allow up to 2 business days for your order to be processed and shipped. If it has been more than 2 business days since you placed your order and you still have not received your tracking number, please check your spam/junk box and then contact customer service.